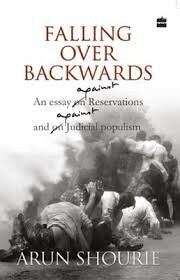 'Falling over backwards - an essay against the reservation and judicial populism' is one of the most meticulously researched and persuading book written by a person with a zeal and a mission in his mind. And the mission was to make it a point that individual should be the unit of the governance, not the interest groups or communities. The author Arun Shourie who has written many more books on the topics which just do not get too much attention in the public discourse predominant today. Written in 2005, Shourie took many cases from the history, words from the constitutional amendments, and excerpts from the judgments of the High Courts and the Supreme Court just to debate on the merit of the reservations being given on any basis. In this book, Shourie emphasizes on basically three things : first, the tendency among the public to register as uppers castes during British Raj and subsequent loosening of the caste boundaries; second, the politicians' approach to identity politics and seeing this as a chance to rise in Indian political landscape; third, the response of High Courts and Supreme Courts and the arguments given by progressive judges. These are three main areas in which the author researched and put forward his arguments. Let us look at them one by one. When the census was started in British Raj, the caste-based census was also started by them. Among other reasons, this was also done to see if different communities can be given proportional representation which was then strictly based on religion. When this was started there were two main trends visible among people. First was caste consolidation, in which many similar caste and sub-castes formed one umbrella group and wished to be enrolled as such. One example that author gives in his book is that of Yadav surname which was adopted by different castes such as Ahir. The second trend was the tendency among people to enroll as upper castes. So many castes so far deemed as lower castes enrolled as different categories of Kshatriyas and Brahmins. People were eager to leave the lower caste stamp on them. The other advancements such as Railways also contributed in fighting with this taboo. People sitting together in railways won't ask the caste of the fellow passenger whereas in villages untouchability was still prominent. The overall effect was that caste boundaries were slowly and slowly getting less relevant. In fact, different communities enrolled as different caste or caste groups in the census and as an altogether different caste or caste groups in the subsequent census. This had a hit on the reliability of census data. British Raj discontinued the caste based census in 1931 citing the unreliability of data so collected. The second part that Arun Shourie touched upon is the politics over the reservation. With reservation for scheduled castes and scheduled tribes firmly in place, demands started for reservation to other backward classes. But with no criteria to define a backward class upon which everybody agreed, castes became synonymous with classes as far as reservation is concerned. Politicians losing credibility resorted to the identity politics and during 1980s demands were so strong that it was possible to achieve those demands from a weak government. Here too it is noteworthy that many times the proper procedures to define a caste as backward were not followed. Procedures said that a backward class commission will study the social, economic and educational status of a community before awarding the status of backward class, but in practice, those groups who had enough electoral clout and those who could protest were included in the backward classes list. The trends that we saw in the early twentieth century where people enrolled them as upper castes are reversed now and there is a clamor in these communities to be declared as backward classes. Then this fact should also be not ignored that the reservation was given based on the data of last caste-based census of 1931. This basis has two arguable assumptions - first, the rate of population growth has remained same and second, the demographics of various regions have not changed despite uneven economic development in different areas in fifty years and a large scale migration due to partition. The third thing that Shourie studied was the response of the High Courts and Supreme Court. To cite the many examples given by Shourie in his book, many times courts would deliver judgments citing Manu Smriti, the impact and influence of an ancient text itself under question and many time they would leave the decision on the executive (the government). Arun Shourie makes one point that in the Western countries, the prospective law officials have to study the judgments of higher courts. In India, this was hardly the tradition leaving many monumental judgments go unnoticed and escaping academic scrutiny. In India, whatever new acts and constitutional amendments were passed by the political class in parliament were later given nod by courts. This has the result that reservation looked more like permanent although it was implemented for a predefined time-period. It would be wrong to say that reservation did not bring any benefit to the communities for which these were enacted, but the point is that these benefits should be debatable and how more deprived people can be given benefits in other ways, apart from the reservation, should be considered too. The fact is that reservation is a reality and no political party can reverse that, we must analyze in retrospect the effects of the reservation and its alternatives. In this book, Shourie's love for detail is impressing but many times many arguments become repetitive and same characters keep coming in at different places for different points to prove. This book is not that an easy read but it is a well-researched book on a political topic full of facts which are hard to find anywhere else.